SUMMARY: The purpose of this study was to evaluate the efficacy of a newly designed circular ring compression device that allows safe and effective glue injection during preoperative embolization of high-flow superficial craniofacial arteriovenous malformations (AVMs). The device was used in 4 cases of craniofacial AVM with multiple feeding arteries and draining veins. It provided a safe glue injection route as well as effective compression of radiating multiple venous drainage routes. Direct-puncture embolization with n-butyl 2-cyanoacrylate (n-BCA) is an effective and safe technique for preoperative devascularization of craniofacial arteriovenous malformations (AVMs).1–3 Both venous outflow and arterial inflow of the lesion should be limited during injection of the embolic material to avoid inadvertent distal migration of embolic material, including pulmonary embolization and occlusion of venous drainage. Manual compression of the draining vein is usually used for flow reduction.3 However, when an AVM has multiple channels of venous drainage, achieving successful blockage of blood flow is technically difficult with manual compression. 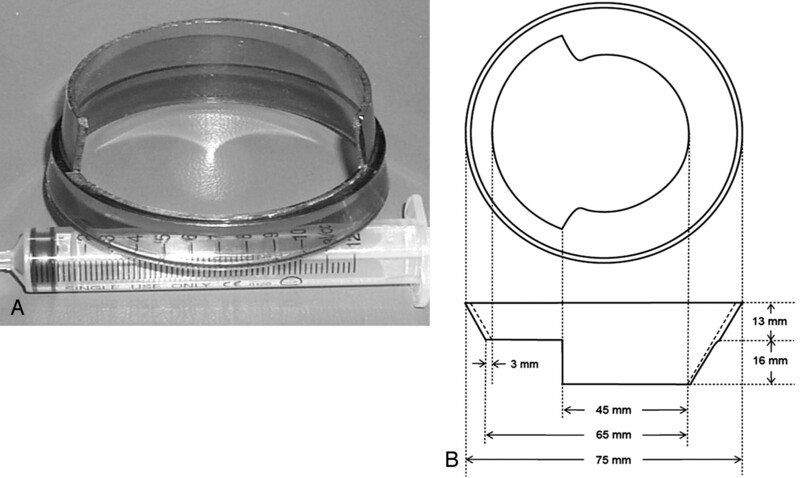 Using a compression device for circumferential flow reduction can be more effective than manual digital compression; however, it is sometimes difficult to inject the glue while firmly maintaining compression of a high-flow vascular lesion.4 The purpose of this study was to introduce a newly designed circular ring device and to evaluate the safety and efficacy of the compression of the vascular lesion during glue embolization of a high-flow craniofacial AVM in the head and neck area. We developed a circular ring device with a beveled edge of 2 different levels at the margin (Fig 1). The circular ring device was made by cutting the body portion of a plastic cup to create an elevated margin in two thirds of the circular portion of the cup body. A, Circular ring device with a beveled edge. The lower margin provides a comfortable injection window while maintaining compression through the elevated margin. Circular ring devices can be constructed by cutting a plastic cup body. B, Plan diagram of the device. The circular ring device was used on 4 patients (4 men; range, 9–55 years of age) with scalp and neck AVMs (Table). These were superficially located high-flow lesions with multiple feeders and radiating venous drainage channels. We evaluated the pre-embolization angiographic findings (ie, feeding artery, draining vein, and nidus shape). A selective pre-embolic angiogram was obtained and analyzed for its anatomic details, including arterial feeder, nidus, and venous drainage. The same angiography (compression angiography) was repeated after the circular ring device was placed at the verge of the vascular lesion and it compressed the lesion (Fig 2). Compression was regarded as ideal when the compression angiogram revealed the stasis of the flow within the boundary of the circular ring device without demonstration of venous drainage outside the device. It was necessary to adjust the compression force while obtaining the compression angiogram to properly compress the veins but not compress the arterial feeders completely to prevent blockage of the inflow. A 37-year-old man (patient 4) with a growing pulsatile mass and bruit caused by a long-standing high-flow arteriovenous fistula in the right anterior lower neck. A, Cutaneous branches of the right external carotid artery are dilated. Multiple dilated venous pouches are connected to the external jugular vein. B, During the compression around the shunt by the circular ring device, contrast medium stagnates within the device margin. C, Final angiogram obtained after glue embolization shows no further shunt. D, Surgical resection specimens were obtained by en bloc resection. Note the presence of glue in the dilated malformed vessels (arrow). Once the position of the device and the degree of compression were determined, direct puncture with an 18-gauge needle (BD Angiocath Plus, Becton Dikinson Korea, Seoul, Korea) was done through the lower margin of the device while we compressed the elevated margin of the device. When the needle was inserted into the lesion and blood was returned through the needle, a direct puncture angiogram was obtained to confirm whether the needle tip was in the nidus, venous pouch, or arterial feeder. Although the needle tip can be placed in the nidus, venous pouch, or arterial feeder, the dilated venous sac next to the fistula seems to be the ideal puncture site because targeting the dilated venous sac is relatively easy and injected glue slowly regurgitates from the dilated vein into the fistula and then into the arterial feeders, leading to complete devascularization of the lesion while maintaining effective compression. If the needle was securely positioned within the vascular space, a 30%–50% mixture of n-BCA (Histoacryl Blue, Braun, Melsungen, Germany) and iodized oil (Lipiodol, Laboratoire Guerbet, Roissy, France) was injected during compression of the verge of the AVM by the circular ring. The operator maintained the compression of the circular ring device until complete polymerization of the n-BCA and iodized oil mixture was obtained. Repeated puncture and n-BCA mixture injection were performed in case there was residual AVM. Migration of the glue cast was carefully monitored by high-quality fluoroscopy. The data of our 4 patients are summarized in the Table. Three had scalp lesions, and 1 had a lesion in the right lower neck (patient 4). On pre-embolization angiography, all lesions had multiple feeding arteries and multiple draining veins. The arterial supplies to the 3 scalp lesions (patients 1–3) were branches of superficial temporal arteries. Draining veins included the superficial scalp, supraorbital, and external jugular veins. An AVM, including a fistula lesion in the right anterior lower neck (patient 4), was supplied by branches of the facial artery, the superior thyroid artery, and the thyrocervical trunk and drained to multiple branches of the external jugular vein. 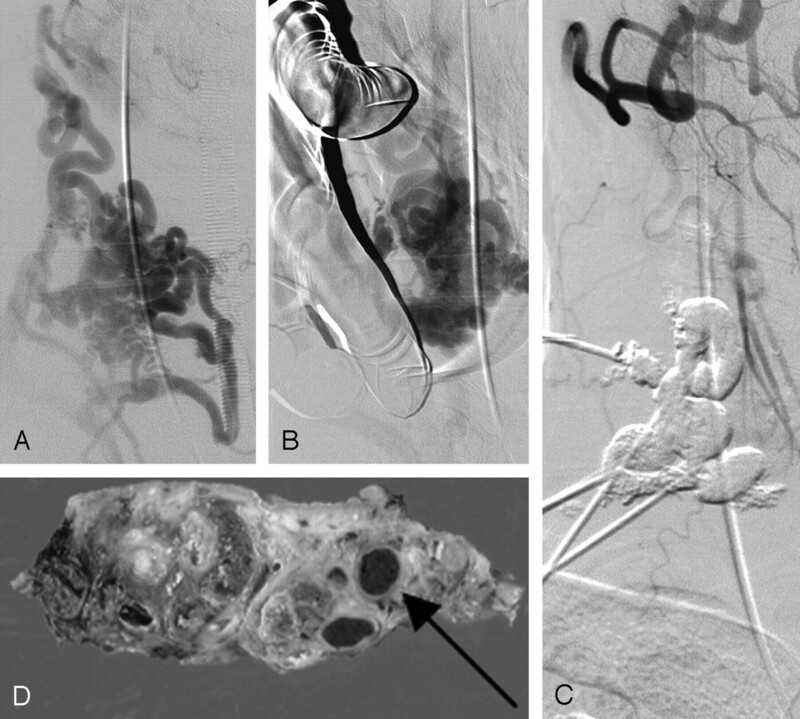 Successful devascularization was confirmed on postembolization angiography. A lesion in the anterior lower neck revealed a small number of residual feeders from the branch of the thyrocervical trunk, which was selected by a microcatheter and additionally embolized by using fragmented gelatin sponge (Gelfoam, Phadia, Uppsala, Sweden). In 4 cases, the glue cast was localized within and/or around the margin of the circular ring without distal migration during injection. The shape of the glue cast changed in 2 patients (patients 1 and 3), especially by using the 30% glue mixture while releasing the compression before complete polymerization. Before surgical excision (from 1 to 3 days after embolization), skin necrosis was not demonstrated and pulsation of the AVM was not palpated at the lesion site. Complete resection was possible in all patients, with a clear resection margin during surgery. After surgical excision of the embolized AVM, all lesions were pathologically confirmed as vascular malformations. Several blood-flow reduction methods that could be used for a liquid embolic agent during percutaneous embolization of an AVM have been documented and include manual compression of a draining vein by a digit,3 band ligation of a draining vein,5 temporary occlusion of a proximal artery by a metallic coil, and circumferential flow reduction by using a circular ring,4 and so forth. The shape of the glue cast changed in 2 patients (patients 1 and 3), especially by using the 30% glue mixture while releasing the compression before complete polymerization. Although the cast remained in the venous side without causing any complication in our study, the change in shape may cause further distal migration of the glue cast. Therefore, we recommend using 40%–50% glue, depending on the treatment plan, because more than 50% glue becomes very hard during surgical resection.11 Although exact estimation of the polymerization time after glue injection is difficult, we think that 2 minutes should be enough for polymerization.11,12 In our 4 patients, the new circular ring device was effective for trapping the glue mixture within the venous sac of the craniofacial high-flow AVM and for occluding the arteriovenous shunt. Compared with the cookie-cutter technique using a simple ring device,4 our new devices were very convenient for compressing a lesion as well as safe and effective for injecting glue through the window formed by beveled edge of the device. Accepted after revision September 20, 2006.